The news of Jon Lord’s death on July 16. 2012 at the age of 71 has been announced. Mentally a lot of us had tried to prepare ourselves for the worst after Jon announced that he was fighting cancer just over a year ago. Hoping. God knows how Jon himself managed to come to terms with it. Cancer is grim in all its forms but pancreatic cancer is particularly difficult to overcome and survival rates are very low, which he must have known. Yet to see his handsome face on the front page of The Guardian site today still came as a shock, the obituary a workman-like precis of his long and varied career which you don’t need me to retread here. Yet as well written as it was it totally missed the central point of his life. Which is just how much people actually loved Jon’s seemingly effortless musicianship, and appreciated his giving everything to what has been for many of us the most important band in our lives. We’ve not lost a family member but it really does feel like that right now. We will each mourn Jon’s passing in our own way. I’ve had a couple of Deep Purple tracks on this morning, listening with tears rolling down my face to Perfect Strangers and Almost Human. But really I could have chosen almost anything by the band. Just about every track they did has Jon’s work at the heart, pinning it all together, driving it on, or rising up to thrill us with another inventive solo. This astonishing musical legacy Jon has left behind is something few achieve. 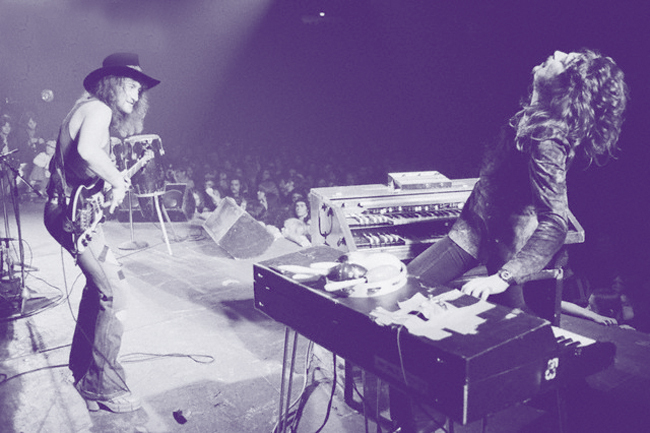 And it’s not just the music; Jon was central to the formation of Deep Purple itself, his relationship with manager Tony Edwards helping to ensure the survival of the concept of the band over those crucial few months when, with nothing much beyond some vague plans and ambitions, it could so easily have fallen apart. On a personal level Jon’s Hammond certainly sucked me into the group in 1970 when having spent my 35p I kicked over Black Night to hear that powerful organ intro to Speed King on the flip. I was hooked. It would be hard to think of any subsequent Deep Purple recordings Jon’s work didn’t enhance or enliven, despite the presence of four equally powerful musical personalities both to work with, fight with and bounce ideas off. If Deep Purple weren’t enough, there was Jon’s parallel career, perhaps obsession at times; that of trying to find a way to forge a new musical relationship between the classical and rock worlds. In this he pushed at boundaries. Some of it may have sounded strange to our untutored ears at the time, but work of the quality of Sarabande converted many, an album so complete it took him another fifteen years or so to transcend it. While Deep Purple’s music will live on, as influential rock bands of their stature do, I suspect just as important to Jon’s legacy will be his solo work, particularly The Concerto. The unforgettable anniversary shows in 1999 were certainly one of the highlights of Jon and Deep Purple’s career as far as we’re concerned. The revising and re-recording of this seminal piece has kept Jon busy during the last 18 months or so and will, as he put it, finally come as close as possible to capturing those ideas which were flying around in his head back in 1969. We should not forget the rush of Jon’s post-Deep Purple work either, an outpouring of often moving and emotional albums arriving almost too quickly to fully appreciate individually, but which will provide us all with much to admire in years to come, even if for the moment such deeply personal music might prove emotionally an awful lot to handle. But amidst all this melancholy, just take your minds back to some of those early reunion shows, the opening few notes of Perfect Strangers – Jon bathed in spotlights, dominating the keyboard as the band kicked into one of their most powerful pieces ever. That for us will be how we remember him. See you Jon you old bugger. This obituary was first put up as a post before being moved here. The comments generated on that original posting were very moving and we have left this up for anyone who wants to read through them. Use this link.